When Samantha Mae Coyiuto was barely ten years old, she had already wrote and illustrated three funny yet engaging collections of children’s stories. Now about to turn sixteen, this third-year high school student and nationally ranked junior tennis player recently launched her fourth book, Flight to the Stars & Other Stories, a collection of three short fiction that tackles serious themes encompassing teenage life and Filipino family dynamics. Samantha began writing short stories using a laptop at the age of six. Having a natural penchant for cartooning, she also did the illustrations for her first three books, a series of fantasy and magical tales in which she displayed not only a talent for storytelling but also a sense of humor that made the stories such fun to read. This is her first book of stories for young adults, in which she exhibits a deft touch for characterization and dialogue, a narrative flair for dramatic tension and charming wit, as well as the ability to tackle difficult issues confronted by individuals and families. It’s written by a Filipino. It’s written by a sixteen-year-old girl. I wrote my first story when I was a seven years old. It was a story about how the different weathers (sunny, cloudy, rainy, stormy) were all fighting over their reign in the sky, which led to the people on earth pleading for them to stop fighting because it was getting hard for them there. The next story I wrote (that I still have a copy of!) is The Two Slumber Parties, were two friends fight and set a slumber party on one date, putting one of their friends in the middle to choose. I wrote more stories after I realized and declared that I wanted to be a write when I grow up, filling notebooks and notebooks with stories which always had a happy ending. So why don’t I have a published novel now? Well, I blame it on real life taking over and me starting to get pickier and pickier with the stories I wrote. That, and computers, because around the time when I could have started submitting stories somewhere, I started getting into web design and that started my career as a web person. I admit to still feeling a pang of regret with my sort of forgotten writing “career”, but that’s why I join NaNoWriMo year after year. Anyway, I was looking forward to reading Samantha’s book because I was curious about what someone her age could write. 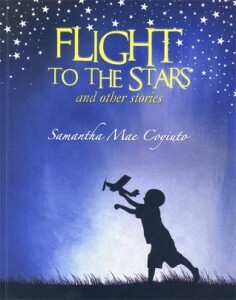 Flight to the Stars is an anthology of three short stories that, as the blurb mentioned, “…tackles serious themes encompassing teenage life and Filipino dynamics.” The title story, Flight to the Stars, tells the story of Mike and his relationship with his father and his mistress, and his own reflections on life as he gets married to the girl of his dreams. The second story, Sapphire, is about a girl and her battle with insecurities particularly with her weight, and her first heartbreak. The third story, The Purple Box, is about a man facing his sixty-first birthday with flashbacks on how he ended up where he was, thinking about the man who had inspired him to hope and the tragedy that shattered all that. There is much promise in this collection of stories that the young author wrote. They’re all positive, family-oriented stories, all full of hope and life lessons. Like what other reviews said, this is the kind of book that I wouldn’t mind letting younger kids read, particularly those who are in their tweens and the ones who are ready to start transitioning to bigger, wordier books. There is a distinctly Filipino feel in their stories that makes them closer to the heart, and yet I think that people from other nationalities will also appreciate the stories, too. That doesn’t mean that grown-ups won’t appreciate this, though. I liked them well enough (even if I don’t really consider myself as a grown up sometimes :P), and the stories kind of reminded me of my younger years and the little concerns that I had then, such as assignments, going to the prom, being late for school, and all that. However, as an adult reader who’s been reading a lot for the past few months, I think the age of the author really showed in her stories. Aside from the simple language, it pretty much showed that the author doesn’t really know much of the different troubles of growing up, at least by experience. I’m not saying that I know everything of course, but I was kind of looking for something in the stories that would evoke some emotions from me that unfortunately I didn’t get. These stories reminded me of the things I wrote when I was younger: written in rose-colored glasses, teetering at the edge of the serious, of the dark and the deep but never really making the plunge to see what’s going to happen after. There were many unexplored parts and issues in the stories that could have been could have made a different impact on the stories. Spoiler warning starts here. Case in point: in Sapphire, the eating disorder that the heroine developed felt like it was rushed, especially on the part on how she got over it. Sure, I understand that you’d do everything for your family, but an eating disorder is not something you’d just get rid of at a snap of a finger, just because someone is watching. I’ve never had an eating disorder but I know friends who have tried to get over it and it’s not easy. It’s not a deal breaker, but I feel that it’s important since this could be something that could spark a discussion with kids and their parents or their teachers, about eating disorders and self-image. Spoiler warning ends here. This may be just me nitpicking, of course…but readers who are looking for a very deep and emotional read may be a tad disappointed, so I would advise you to set your expectations right if you would decide to read this book.